For over 44 years Dan and Lee Ross have worked side by side designing and creating sculpture and prints. Their home and studio is located in Hovland, Minnesota, a small town on the North Shore of Lake Superior. Living in northern Minnesota and along the lake has had a dramatic impact on their work. Recent adventures to the Atlantic Provinces of Newfoundland and Labrador have also had an influence. In Newfoundland they rent studio space at St Michaels Print Co-op on St John’s Harbor. 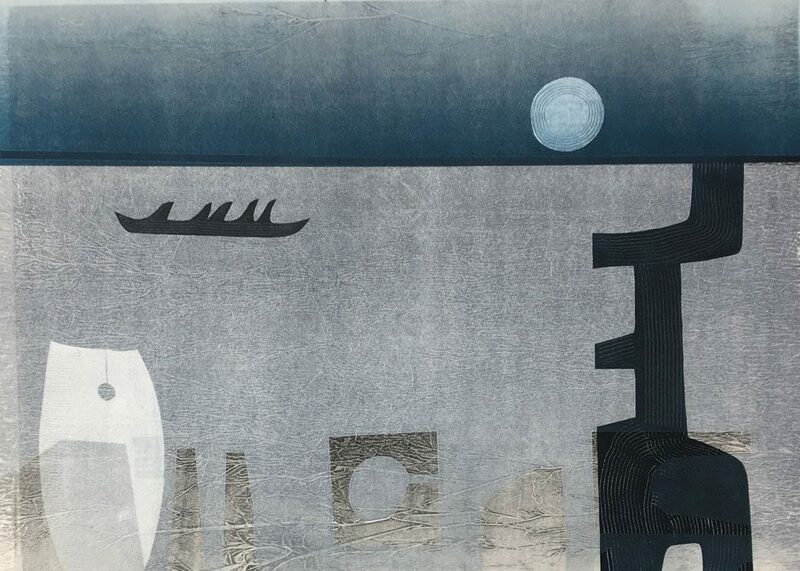 With ink and paper they have created a series monoprints inspired by the wild North Atlantic Ocean with its massive icebergs, sea bird colonies and large mammals. In May they will continue their adventures west to Yellowstone National Park to observe the bison calving and grizzly bears emerging from their winter dens. Dan and Lee met in 1972 as college students at the University of Wisconsin-River Falls. Dan from Madison, Wisconsin and Lee from St. Paul, Minnesota began an artistic and professional collaboration that continues today. Their work has been commissioned for numerous private and public art collections, including Children’s Hospital in Minneapolis and the University of Wisconsin-School of Pharmacy in Madison. They have exhibited extensively throughout the United States and their work is included in numerous collections including the Mayo Clinic and the Minnesota Historical Society. The artists will be present at the opening reception Saturday, April 27 from 2-5 pm. The opening reception and exhibition runs concurrently with Chain of Lakes by Justin Terlecki. Both shows continue through June 1, 2019.